Calling all Twihards! Breaking Dawn Part 1 opens nationwide on November 18 but you already know this since you've been counting down the minutes for the past several months. What if we said that we had a few tickets for a special premiere on Wednesday, November 16--a full 2 days ahead of when everyone will get their first chance to see it. Well, it's true and your pals at Cupcake Royale want to hook you up with one of the 25 pairs of tickets we will be giving away. For the next five days leading up to the preview, everyone who purchases a cupcake at one of our five cafes will be eligible to enter to win a Twilight Prize Pack, which includes 2 hats, 2 t-shirts plus a pair of tickets for the Wednesday, November 16 screening at 6pm. We will randomly pick one name every day for each cafe (five daily winners)! And all you have to do is purchase a cupcake. If you're counting calories, surprise a friend with a cupcake--they don't need to know that you're tying to win a contest. 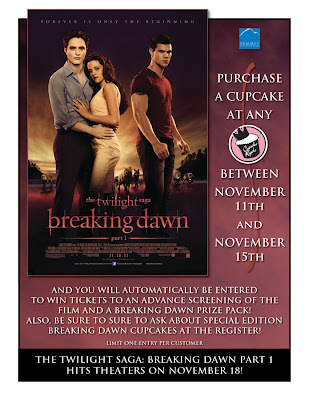 Also, we'll be selling special Twilight-themed cupcakes for the next five days! 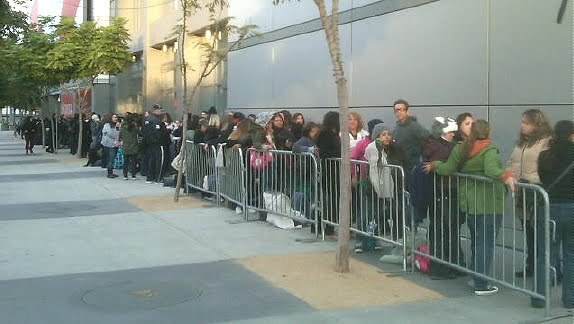 Oh snap, we caught Twilight Fever! D.I.Y. 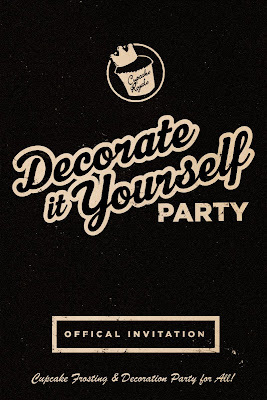 (Decorate it Yourself) Frosting Parties! 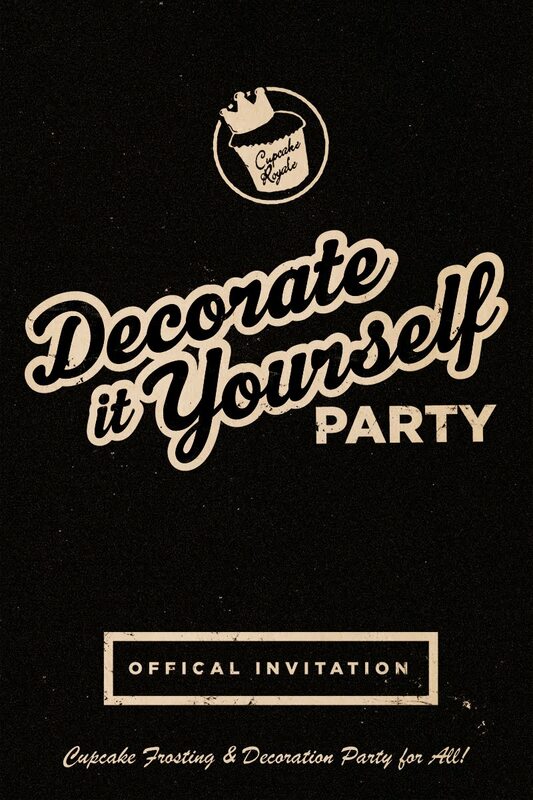 Calling all party people, parental units, nannies, mannies, grannies, guncles and cool kids of all ages! We need you! 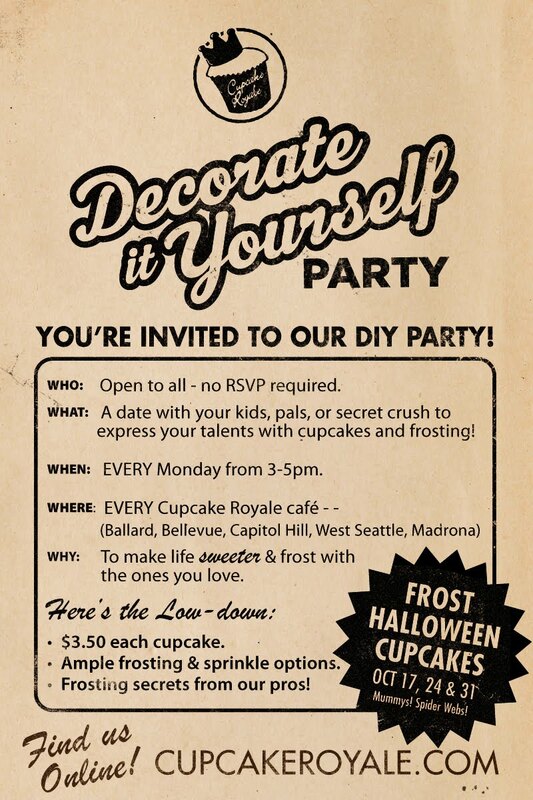 DIY (Decorate It Yourself) Cupcake Frosting Parties are coming to your local Cupcake Royale every Monday from 3-5pm. We provide the cupcakes and frosting, you provide the creativity. Together, we're making some afternoon delight! Starting this Monday, October 17 (and running through the end of the year), swing by and flex your mad frosting skills.Impress your friends, meet your neighbors! 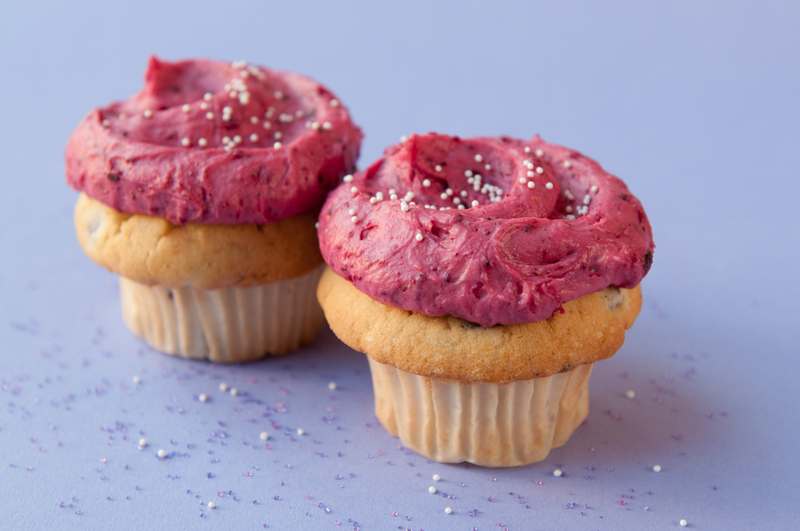 $3.50 gets you a fresh-baked cupcake, an assortment of our tasty frostings and sprinkles, plus expert tips from our Pro frosters along with a box to take home your creations to share with the ones you love! Keep it simple with our signature swirl or get intricate and try your hand at one of our seasonal designs like a spooky spider web. 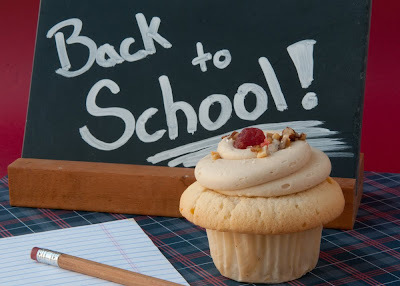 September has arrived and that means that summer is winding down, just as school is just starting up. 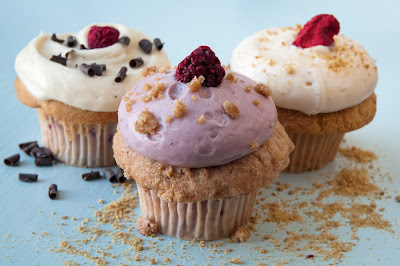 This month, Cupcake Royale is bringing back an old friend, Huckleberry Cupcake, and introducing you to the new kid in class, Peanut Butter and Jam Cupcake. We think it's a pretty sweet way to end summer. Say goodbye to summer and hello to huckleberries. It's a fair trade-off in our book and we always celebrate September with our Huckleberry Cupcake (aka “the Huck”). We fold in fresh, local huckleberries (fresh, as in they were picked for us this past weekend) into our vanilla cupcake and top it with a huckleberry buttercream frosting. This cupcake brings all the bears to the yard. We have partnered with local farm Foraged & Found Edibles to provide us with our huckleberry crop this year. In case you don’t know what a huckleberry is, think of it as the little brother to a blueberry but with even more flavor. Peanut Butter and Jam, sitting in a tree. 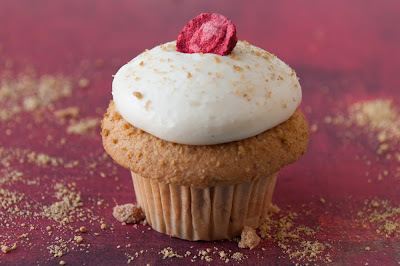 This classic combo has our vanilla cupcake, filled with fresh local strawberry jam (fresh, as in they made it last week) topped with a super fluffy, salty peanut butter buttercream. Sprinkled with chopped peanuts and a coarse sugar and sea salt. Now through September 30th at all five of our cafes. August ranks as one of the region's sweetest months so it only makes sense that our seasonal flavors would reflect that. There's no way around it, Strawberry Shortcake was this year's favorite Strawberry Festival flavor! We heard from you on Twitter (follow us!) and Facebook (like us!) and in the cafes. We totally get it especially since we've had more than our fair share of them ourselves. The light, strawberry-flavored whipped cream frosting ringed in graham cracker crumbs goes perfectly with the sweet strawberry-infused vanilla cake. Not carrying it over would have been cruel. Rumor has it that upon tasting this new flavor, one of our employees actually teared up. 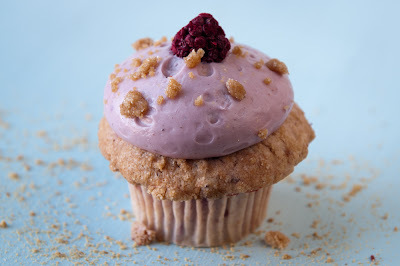 A blackberry cake topped with a blackberry whipped cream frosting is finished with a cinnamon streusel crunch. We can't guarantee that it'll make you cry with delicious happiness, but let's just say that we wouldn't judge you if it did. How do I love thee? Let me count the ways. First, your tart raspberries and semi-sweet chocolate chips, gently folded into a tasty vanilla cake. Second, how you are topped with a fluffy, white chocolate buttercream frosting and garnished with a fresh raspberry and chocolate curls. It all adds up to a double dose of sweetness with just a hint of tart. 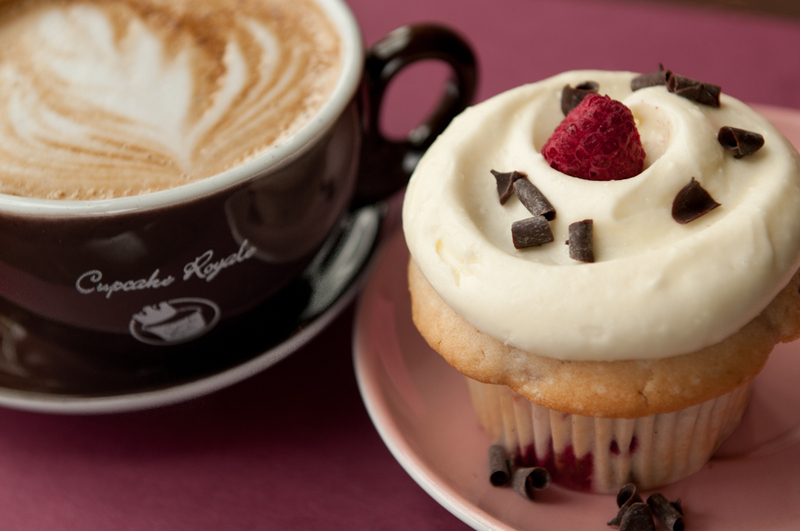 Delicious with a latte! But this is a love that can't last forever; these flavors are only around through August 31. Have a sweet summer from Cupcake Royale! Who doesn't love a good mystery? Especially when the reward is a beverage and a delicious 2 pack of our cupcakes! For the month of August, we decided to keep our exciting summer going by having 3 flavors of the month again. 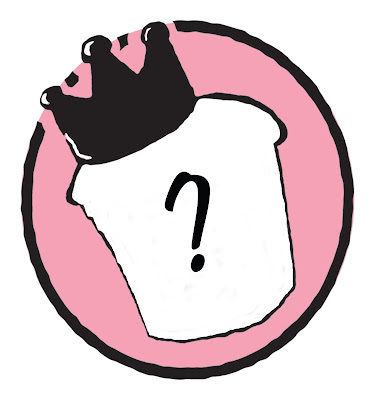 Right now on Facebook, our fans our are using their sleuthing powers to figure out which 3 flavors we'll be featuring next month. Yesterday, they correctly guessed which strawberry cupcake we're holding over. And today, they just guessed the second flavor. Check out recent posts to get caught up. Tomorrow, we'll be giving the clue(s) for the final flavor. The first five people to correctly guess all three flavors exactly will each win a beverage of their choosing and a 2 pack of cupcakes. Head over to our Facebook page to play. Day 1 - "one of our Strawberry Festival flavors"; "we want 'berry nice weather'." Day 2 - "Back in black. "; "You'll find it on some shoes..."
Strawberry 66 - now through the end of July! Oh man! I hate decisions! For the birthday party tomorrow, do I bring a dozen Strawberry 66 cupcakes since they're only here through the end of the July? 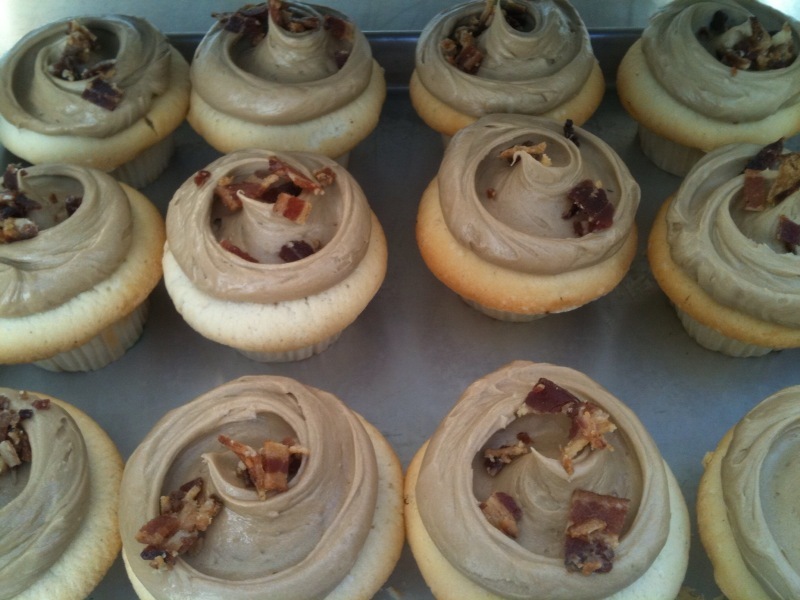 Or do I bring a dozen Whiskey Maple Bacon cupcakes since they're only here through Sunday for Capitol Hill Block Party (Cap Hill store only)? 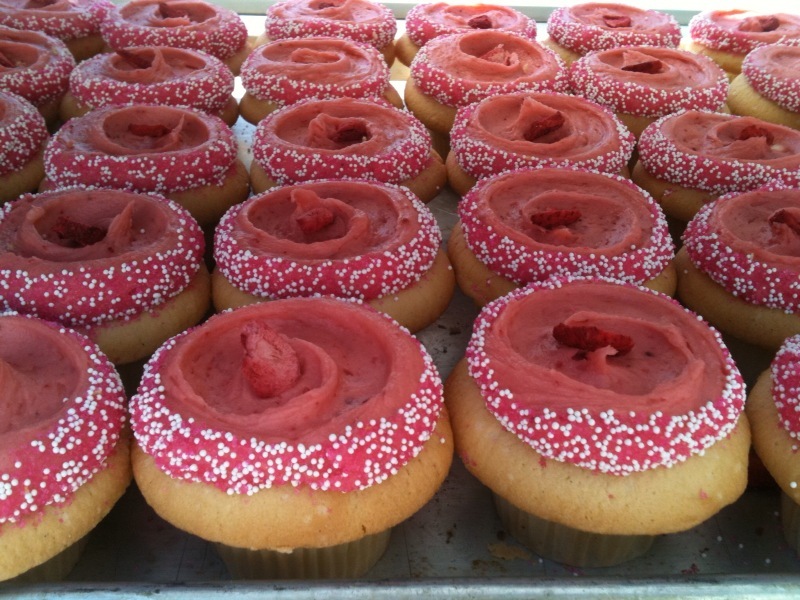 And what about our other Strawberry Festival flavors, also only here through the end of the month? The only thing to do is get an assortment! Maple Whiskey Bacon - now through this Sunday! Last Thursday, Cupcake Royale founder Jody Hall presented a check in the amount of $10,000 to It Gets Better founders, Dan Savage and Terry Miller. Our Capitol Hill cafe was full of fans, friends and family--all gathered to hear Jody, Dan and Pride Foundation scholar, Andrew, discuss the personal importance of this project. Dan stressed the impact of this contribution and said that it was the largest, single donation yet in the history of the project. We're already brainstorming our next fundraising project for later this year. So if you know of a great local organization that could use some help, we'd love to hear your suggestions! You know you're a fan. Make it official. Washington Bus - Get on it. Seattle's original neighborhood cupcake bakery. Baking delicious, old-fashioned cupcakes with love since 2003.